What you didn’t already know about cantaloupes, I’ve discussed in detail here. So, let’s begin! Carotenoids are powerful compounds present in cantaloupes. They help prevent and treat age-induced macular degeneration. Macular degeneration is a top agent for permanent blindness. It leads to the deterioration of the macula, which is the primary centre of the retina of the eye. The macula is responsible for visual sharpness. For that you need a daily intake of carotenoids, which are present in abundance in cantaloupes. Even though there is no long-standing cure for macular degeneration, you can resist impaired vision with the help of a few healthy lifestyle choices. Key Takeaway: Eating cantaloupes regularly may have the potential of preventing age-induced macular degeneration in older adults. With the help of carotenoids, there’s significant reduction of inflammation in people who are more likely to suffer from eye disease. Tissue growth and tissue healing requires the proliferation of collagen strength for damaged skin cells and tissue. With proper nutritive supplements, you can heal wounds faster and accelerate the growth of tissue cells for natural activity. Cantaloupes contain a good amount of vitamin C which is beneficial for treating skin wounds and for tissue growth. Vitamin C supplements are used for treating wounds faster. Plus, they’re consumed by patients as a pre-treatment and pro-treatment for an surgical situation. Vitamin C has many surprising benefits for the human body. They enhance iron absorption, reduce inflammation, fight cancer, and prevent diabetes. All this put together show that vitamins are essential for your everyday life. These water-soluble vitamins repairs tissue, accelerates their growth, and blocks any age-related damage in the skin tissues and blood vessels. Key Takeaway: Vitamin C plays a very important role for proper tissue repair and growth in the human body. It is needed to making tissues more immune to damage and to heal faster. Cantaloupes have such powerful vitamins in abundance, hence it’s essential to consume sufficient amounts of it for the optimal growth and repair of tissues. Gastrointestinal disorders include digestive problems, abdominal pain, heartburn, irregular bowel movements, constipation, liver diseases, and metabolic problems. The main cause of such disorders is presence of harmful bacteria in the body. For defending against gastrointestinal diseases, potassium restricts bacterial growth and accelerates proper sodium and water absorption in the body. Potassium deficiency often leads to kidney failure and intestinal digestion in the body. Key Takeaway: Potassium protects the body against bloating and water retention. It prevents gastrointestinal health by promoting better food absorption in the bloodstream. Cantaloupes are considered good foods for optimal gut health. Cantaloupe is a nutritive alkaline fruit that is high in folate, fiber, and minerals. With its low cholesterol levels and saturated fat levels, it’s one of the most effective ways to treat different types of cancer. You need something powerful to defend your body against excessive inflammation caused due to free radical which is a major agent of cancer. With the help of cantaloupes, you can prevent the development of various types of cancer including prostate cancer, breast cancer, pancreatic cancer, and colon cancer. Key Takeaway: Many studies were conducted to prove the efficiency and benefits of eating cantaloupes on a daily basis. For cancer patients, eating an alkaline fruit like cantaloupe is generally associated with reduced proliferation of cancer cells and a great alternative to chemoprevention. Eating cantaloupes daily may provide potential inhibition of inflammation which can lead to cardiovascular diseases. Cardiovascular diseases arise when your blood vessels get affected due to excessive inflammation and oxidative stress. It can lead to other severe heart problems including coronary heart disease, high blood pressure, congestive heart failure, and stroke. For stimulate proper blood flow from the heart to various organs in the body, you need a daily intake of beta-carotene and vitamin C. Both of which are present in cantaloupes. As an antioxidant, vitamin C plays a vital role in the prevention of blood flow inflammation. It reduces the level of oxidants in the body by fighting free radical damage. Eating cantaloupes to control blood pressure levels and have the ability to prevent restricted blood flow and plaque buildup in the arteries increases your chances of having a strong heart. Key Takeaway: Cantaloupes may prevent your chances of developing many cardiovascular diseases. It can regulate better blood pressure levels, which can lower your risk of heart attack and stroke. Cantaloupes contain phytochemicals with many anti-inflammatory properties which help prevent bone and cartilage damage. Cantaloupes are loaded with antioxidants that stimulate your body’s natural immune defense against free radical damage and age-related disorders. This plays a vital role in preventing the depletion of bone mineral. The study conducted showed that increased intake of phytochemicals restrict inflammation and apoptosis in the human body. These two factors lead to cellular suicide, according to science. Key Takeaway: Cantaloupes play an important role in preventing and treating bone disorders including arthritis. It benefits your joints, bone mineral density, and cellular recovery for healing bone fractures and breaks faster. While it also strengthens your bones by reducing inflammation in the body. Cantaloupe is rich in water and fiber, both of which are essential for stimulating good hydration levels in the human body. Good hydration supports heart health, digestion, cognitive, and other processes in the human body. If you experience frequent headaches, dryness, and fatigue, by increasing your cantaloupe intake you can alleviate all symptoms of dehydration effectively. A daily intake of cantaloupe for dehydrations goes a long way for preventing lifelong diseases. Key Takeaway: Cantaloupe contains high amounts of water which helps prevent severe dehydration symptoms. It regulates good digestive, heart, and cognitive pressure by increasing the amount of water and fiber content in your diet. It is a common known fact that people who have a regular intake of dietary fiber are less likely to experience constipation than those who don’t. A poor outcome of dietary fiber intake for people experiencing irregular bowel movements must increase their cantaloupe intake as cantaloupes are rich in dietary fiber and water. As you know already, cantaloupes are good fruits for gastrointestinal health and they help reduce inflammation in the colon. All the more reason why a fiber-rich diet is essential for your good health. Key Takeaway: Cantaloupes are high in dietary fiber that provide constipation relief. They also reduce the risk of developing chronic constipation which could damage your digestive system, especially your intestine. Studies on patients with chronic constipation show that an increased intake of dietary fibers shows positive results against the symptoms. Foods that are low in cholesterol levels and saturated fats are considered good for maintaining optimum body weight. Cantaloupes are a good source of nutrients beneficial for weight loss while providing very little sugar, cholesterol, and saturated fats. The dietary fiber content helps in filling up your stomach so you feel full for longer periods of time. Hunger often leads to unhealthy food intake, which can be suppressed with the help of fiber-rich fruits and vegetables. Excessive weight gain can lead to diabetes, heart problems, and obesity. Studies show that the phytonutrients present in cantaloupe improve blood sugar levels and stimulate optimal blood pressure levels, which is essential for weight management. Regulating good anti-inflammatory and metabolic levels is fundamental for weight loss. Key Takeaway: Cantaloupe contains several nutrients that aid in weight loss. They help fill up your stomach and for longer too. Cantaloupes are a good source of lutein and zeaxanthin. They greatly contribute to eye health for a healthy lifestyle. If you spend a lot of time in the sun or you’re already struggling with a retinal disorder, it’s inevitable that you eye’s sensitivity to light is high. Eating cantaloupes regularly for your good eye health is very essential. When there are harmful reactive oxygen species present in the human retina, alkaline fruits rich in carotenoids can protect the macula from deterioration. Cantaloupes boost immunity to fight severe eye diseases like macular degeneration, especially in older populations. Key Takeaway: Studies suggest that cantaloupes may help reduce eye diseases arising from oxidative stress and UV radiation exposure. Cantaloupes contain carotenoids that help you see clearly and avoid age-related eye diseases. Kidney disease, or chronic renal failure, is a long-standing condition that often takes years to proliferate in the human body. People with this disease often experience no symptoms. Although this condition can be diagnosed with a simple blood test. If left untreated, chronic kidney failure can lead to dialysis treatment or a transplant. Cantaloupe is a diuretic fruit which is an essential factor for chronic renal failure. It stimulates renal blood flow and is good for water retention. Linked with kidney disease are other severe conditions including hypertension, hyperkalemia, and vascular congestion. Exposure to toxins aggravated by environmental factors play a very important role in chronic kidney failure. It restricts conditions like diabetes, bladder obstruction, and even cancer. Key Takeaway: Cantaloupe is a low-fat fruit, plus it falls under the category of diuretic foods. The nutrients present in cantaloupe are resistant to kidney-related diseases that is a major agent to chronic renal failure and cancer. Free radicals, in overwhelming amounts in the body, can cause severe drain and organ damage. It messes up your biological functions and increases inflammation in the body. Such a reaction is never good for the body as it makes your immune system more susceptible to chronic diseases that are often life-threatening. With the increase in free radical production, your natural defenses are at loss. Research has linked antioxidants to free radical-induced diseases including cancer and Alzheimer’s. Other factors such as chronic pain are also affected greatly due to oxidative stress or inflammation in the body. Eating cantaloupe on a regular basis will improve your chances of experiencing less pain. It is a good dietary food for boosting your body’s defence against environmental factors and free radical damage. Key Takeaway: The antioxidants present in cantaloupes neutralizes free radicals in the body. It reduces pain and restricts radical-induced cellular damage in the human body. Now that you know how beneficial the fruit is, it’s time to incorporate it into your daily diet. You should know that cantaloupe is not just a breakfast ingredient. You can use it for savory and sweet dishes as much as you can for smoothies and salads. 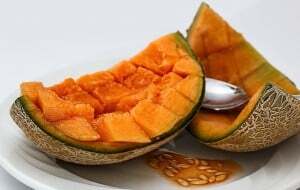 The best part about cantaloupe is that it is considered to be the purest pleasure of the summer season. And that’s just around the corner, isn’t it? Fresh, juicy cantaloupe is one of the favorite melons of the season. So let’s find out how we can add cantaloupe to all kinds of delectable dishes. When it comes to cantaloupe, you need a dish as delightful, light, and fresh as this. Mix all the ingredients together in a large bowl and cover it with a plastic wrap. Place it in the refrigerator for not more than 2 hours. This time is enough for the flavors to blend thoroughly. Following which you can serve the melon cucumber salsa with grilled chicken or fresh fish. Who says you can’t cook Italian with a little bit of cantaloupe? Boil some salted water. Cook the pasta in it until it becomes tender. This should take 8-10 minutes. Drain the spaghetti and place it in a bowl. Add cheese to this and toss it well. Put the melon in the food processor to blend it. Keep it aside. Heat the butter and cream in a saucepan on medium heat. Once the mixture starts to boil, lower the heat. Wait for the butter to melt. Once that happens, the mixture will become smooth. Then add the lemon juice, whiskey, and melon. Simmer this until the blend starts to thicken, which should not take more than 10 minutes. Sprinkle at least one teaspoon of pepper and one tablespoon of salt over it and stir. Pour this sauce over your pasta and toss the whole thing until all of it is coated. Finish it off with some seasoning of pepper and salt before serving. When it gets hot, all you need is a simple chilled cantaloupe refreshment to keep you cool. Peel as well as slice the melon into big chunks. Place these large pieces, ginger, honey, lemon juice, salt, and yogurt into a blender. Blend it until this mixture becomes creamy and smooth. Then add the mint leaves. It’s important to pulse them until all the leaves are chopped completely. Pour this mixture into the airtight container before placing it in your refrigerator. Let it rest inside for at least an hour. Following which add the cream and transfer the soup into small bowls. Feel free to garnish them with mint leaves. Never heard of a fruit pizza? Well, it tastes better than you think. Just like pineapple, cantaloupe as well makes for a tasty pizza topping. The dough goes into a large bowl sprayed with some oil. You can cover this with a plastic wrap. The dough ball tends to rise until it becomes twice its initial size. This takes about 2 hours. Place a baking stone on top of the grill grates and preheat the thing on high. The stone needs to be extremely hot for the pizza dough. Roll the dough gently into a circle measuring 13 inches. Sprinkle some cornmeal on a baking sheet before placing the crust over it. Blend together honey and ricotta cheese. Spread the ricotta on the pizza crust’s surface. Then add the cantaloupe pieces on top of this. Just when your grill hits 600 degrees, you need to check the crust by shaking it on that baking sheet. It’s important to slide the crust on top of the stone. Cover it and grill it for not more than 5 minutes. Do another check in about 3-4 minutes. The pizza tends to cook fast when your grill is extremely hot. But you don’t want to burn the crust’s bottom either. After it’s done, add the basil, pine nuts, and some salt to taste. Cut the pizza and serve it while it’s hot. The next best option after the classic lemon meringue is this sweet cantaloupe pie. So I’ve got all your pie cravings covered. Preheat your oven at 350 degrees Fahrenheit. Mix the cookie crumbs with melted butter. Pour this over a pie plate and bake it for at least 15 minutes. You know it’s done when the crust turns light brown along the edges and the top. Set it aside. Then increase the oven temperature. 400 degrees Fahrenheit should be good enough. Slice the cantaloupe in two pieces and eliminate the seeds. You need to remove the pulp and place it in a saucepan. Heat the cantaloupe pulp on medium heat to get the juice out. Then transfer this to the blender to process it until the mixture becomes smooth. The required amount of cantaloupe is 2 cups. Pour all of this back into the pan. Mix the salt, sugar, and flour in a bowl. Take another bowl to dissolve the cornstarch in half teaspoon of water. Then add both the cornstarch and flour to the cantaloupe saucepan and let it cook. Let it go on until the mixture thickens. Now take the egg yolks and add two tablespoons of water to it. Pour a little bit of the above mentioned mixture into these yolks so they heat up gradually. Then add the yolks to the saucepan and let it cook for 15 minutes. During this time, it’s important to keep stirring till the mixture becomes creamy and thick. Turn off the heat. Now it’s time to bring in the vanilla and butter. This should make the filling look like pudding or custard. Pour this into the pie crust that you prepared earlier. Then you use the tartar cream and egg whites. Beat them together until the blend becomes frothy. Put in the six tablespoons of sugar. Continue beating. The final step before baking is to spread the meringue over the filling. You can smoothen it out using a spatula. Finally, it’s time to bake it. 12 minutes should get the job done. You can store the pie in the refrigerator if you like to serve it cold. There’s nothing more appetizing and creamier than this perfect summer sweet cantaloupe dish. Puree cantaloupe in your blender until the paste becomes smooth. Pour it into a glass and make sure that you press gently on the solids. Pour at least 1/3 cup of the juice into a bowl. Drizzle gelatin over it and leave it be for 5 minutes. During this time, beat the yogurt into the remaining juice. Then add two tablespoons of honey, cream, and salt into a saucepan. Let it simmer on medium heat. Bring in the gelatin mixture. Cook the thing for about a minute. Then pour the cream mixture as well. It’s time to divide this into 5 to 6 different glass bowls. You can then refrigerate it for two hours. On the side, mix the remaining honey along with blueberries and blackberries in a bowl. Mash the berries so their juice leaks out properly. Place this in the refrigerator too. After the two hours have passed, you can unmold the custard with the help of a knife and serve it with the delightful berries. To promote a healthy way of living, cantaloupes support heart, brain, and immune health. It reduces inflammation, fights cancer, and promotes digestive function. You’ll find cantaloupes as a daily lifestyle choice in European and North American countries. You can eat them as fresh fruits, as a salad, or as a healthy meal. There’s nutrient diversity in cantaloupes as it hosts a bunch of nutritive compounds that score good in terms of maintaining health and well-being. Being a good host of fiber, potassium, iron, vitamins, and carotenoids, there’s so much that you can work with. According to multiple science-backed reports, cantaloupe is a delicious and hearty fruit considered to be a staple diet for anyone looking to rejuvenate their diet. Original Article from Jen Reviews.